← My Top Sale Jackets And Coats From Express! Hi everyone, I hope you all had a nice weekend. 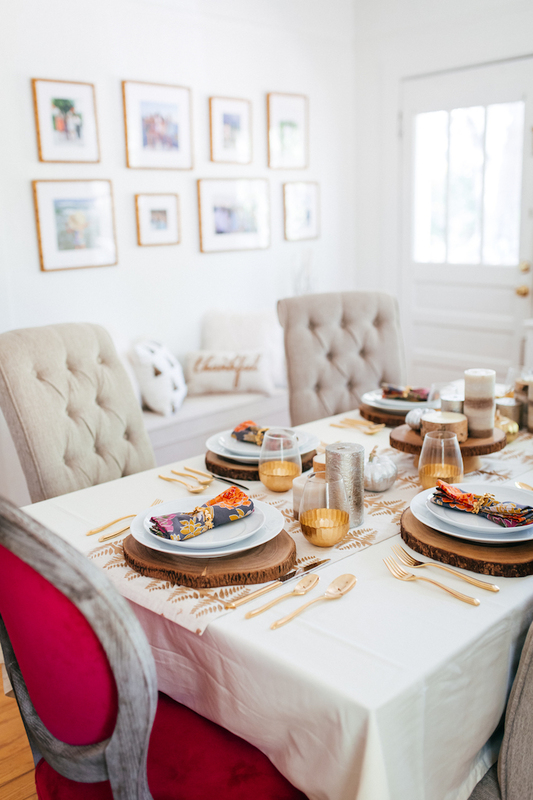 Today I’ve partnered up with World Market to share 5 Tips On How To Create The Perfect Thanksgiving Table Setting for your home! Thanksgiving is one of my absolute favorite holidays and that or may not be because it’s basically a day where you get to stuff your face in front of your family without judgement because everyone else is eating just as much. I’m only kidding…kinda. 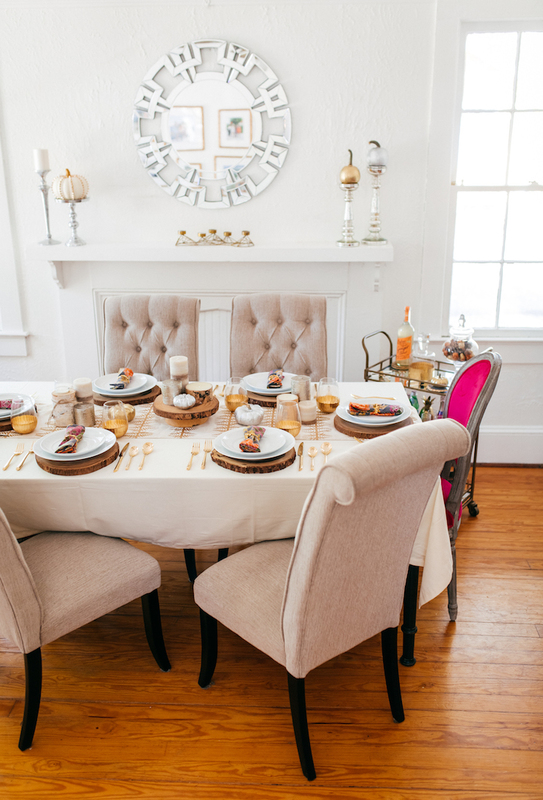 Anyway, here are some tips to help you create the perfect Thanksgiving table setting! 1) Choose a theme and color scheme! 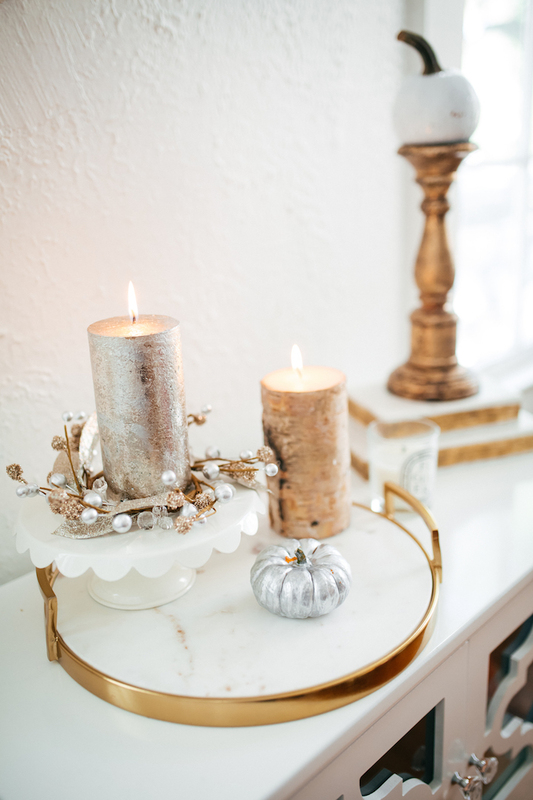 I chose a rustic-glam theme with a mix of metallics and wood. 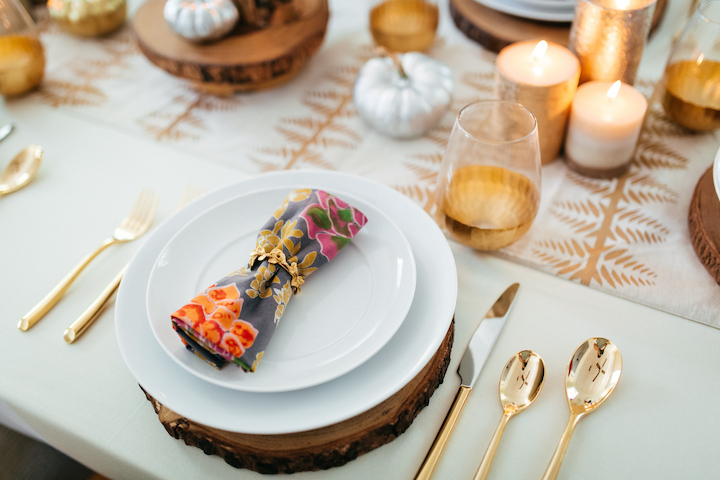 For my color scheme, I went for silver, gold, neutral and a colorful hint of print with the linens. 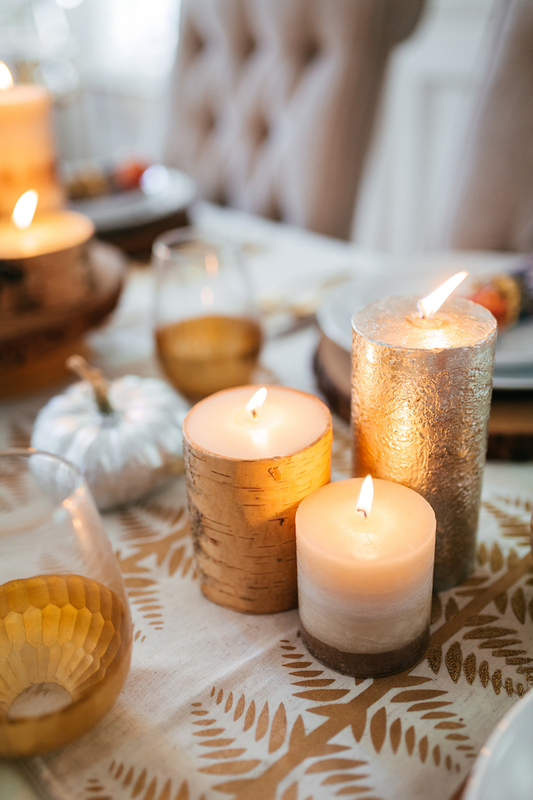 2) Pick a centerpiece or get creative and make your own! 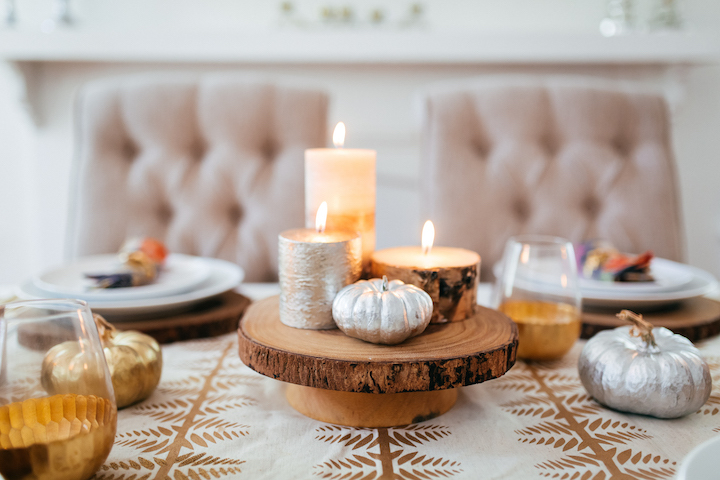 I used a wood bark pedestal stand, candles and metallic painted pumpkins to create my centerpiece. 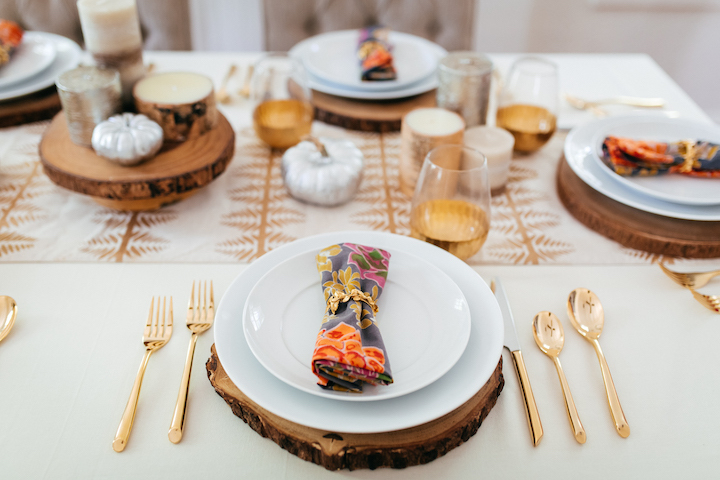 I highly suggest adding a table runner on top of your table cloth or bare table to help accentuate your centerpiece. 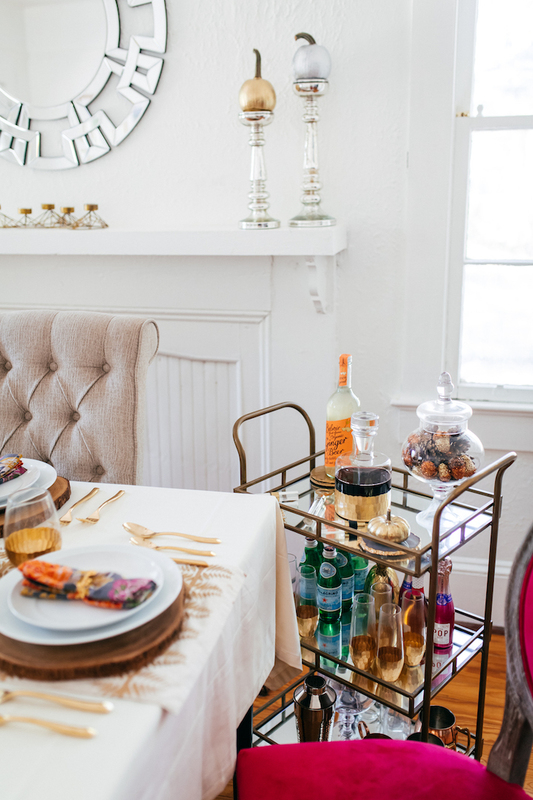 Also, when it comes to long rectangle tables, I love extending the centerpiece all the way down on both sides so everyone gets a nice view of your masterpiece! 3) Count your silver! 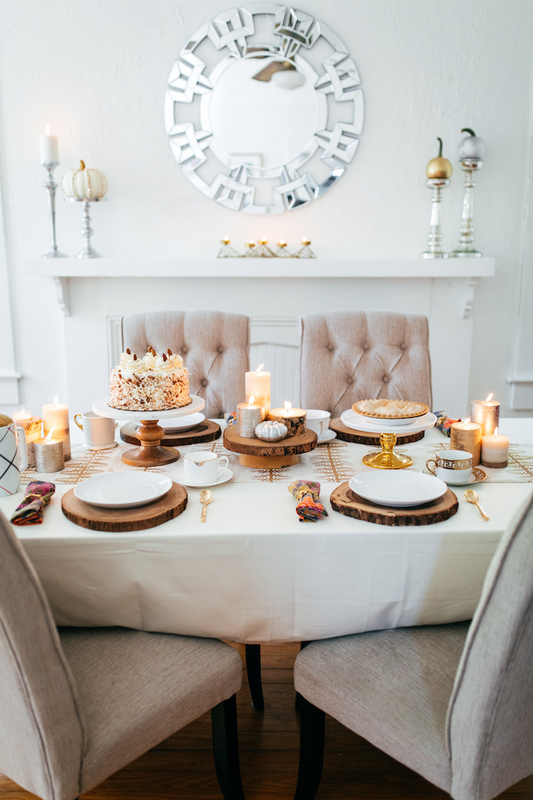 Make sure you have enough utensils for every seat as well as every course. 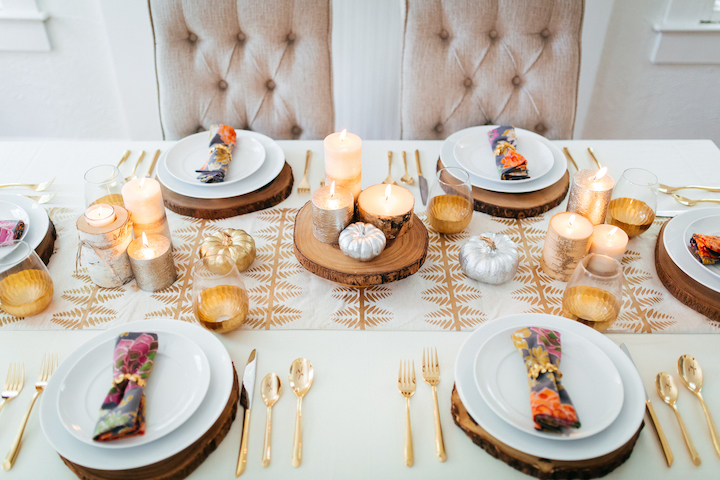 I love this gold set of silverware from World Market. 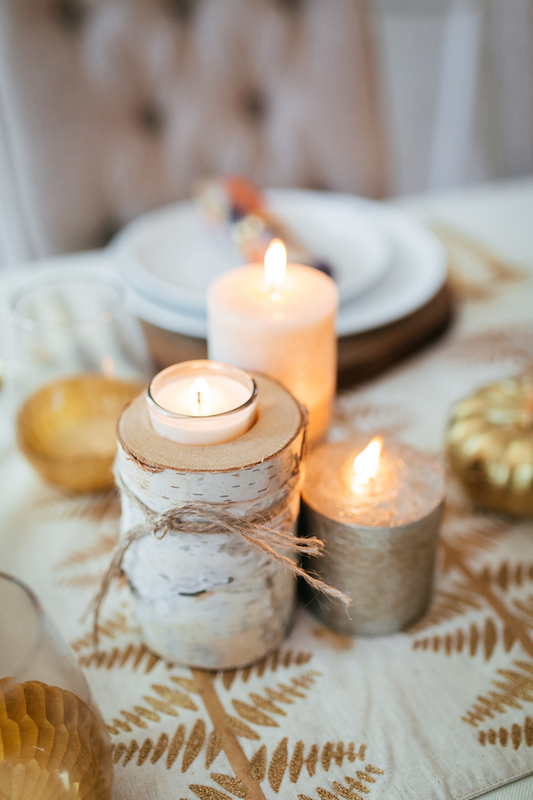 Oh and don’t forget to place them in their respectable spots, and I won’t judge you if you have to google proper table settings because I had google it too! 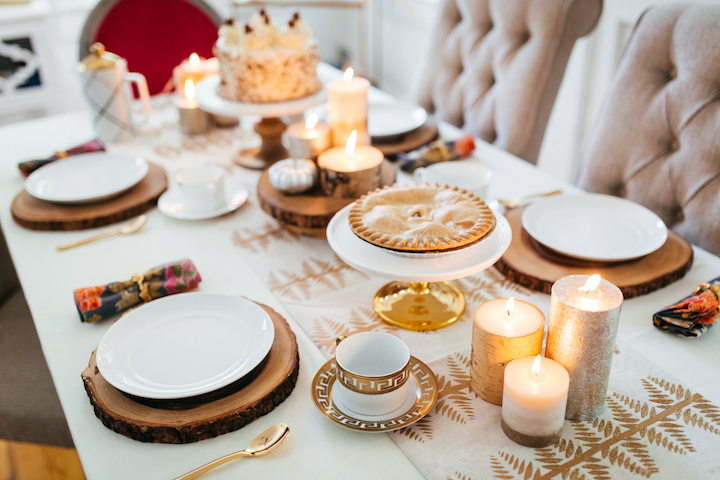 4) If you don’t have enough matching place settings, don’t be afraid to mix and match. 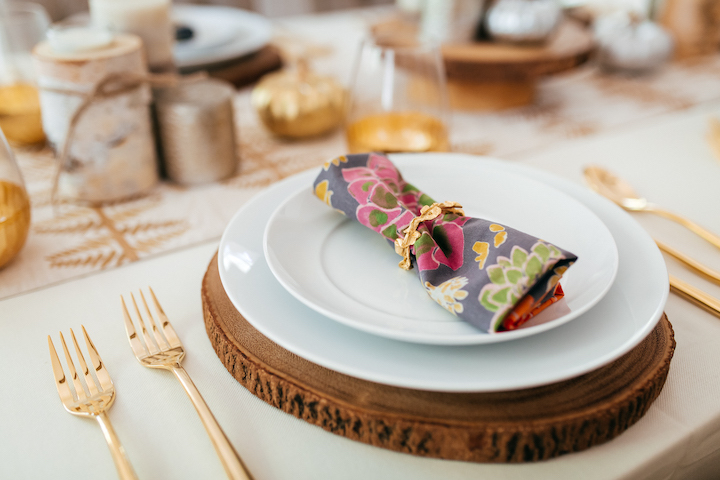 Just make sure that you mix and match with more than one place setting so one feels like the odd one out. Also, name cards are a nice touch too because they make your guests feel wanted and welcome. 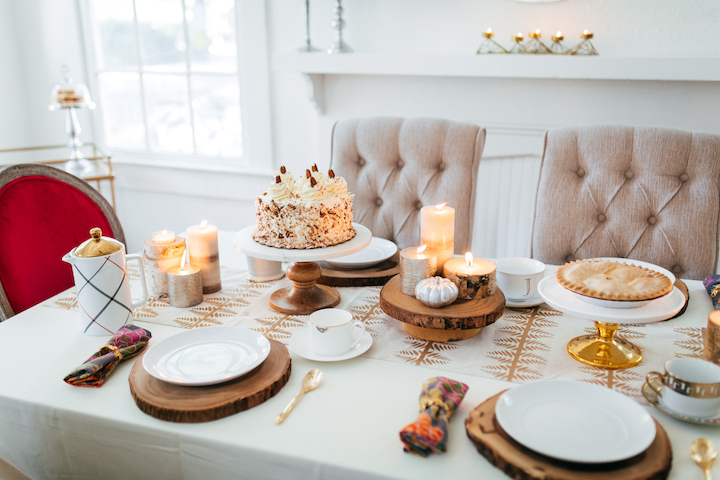 Plus they’ll make your table setting look more uniform if you decide to go with a mix and match theme. 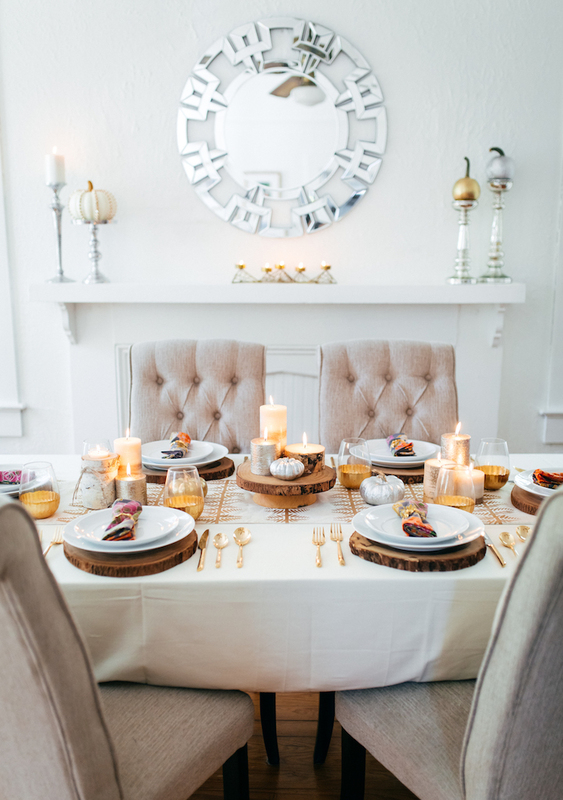 5) My last tip for hosting Thanksgiving at your home is stay calm and be thankful! I know that inviting your entire family and even friends can be stressful, but don’t forget to count your blessings! BONUS TIP! 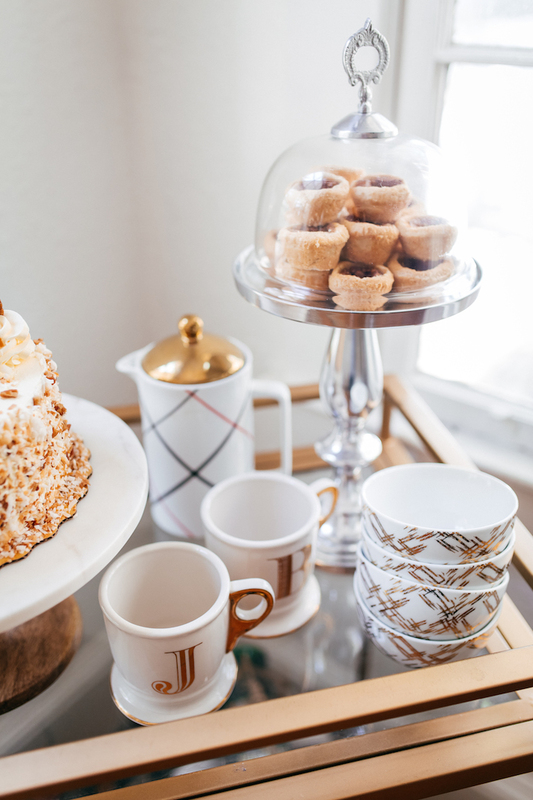 Display your Desserts! 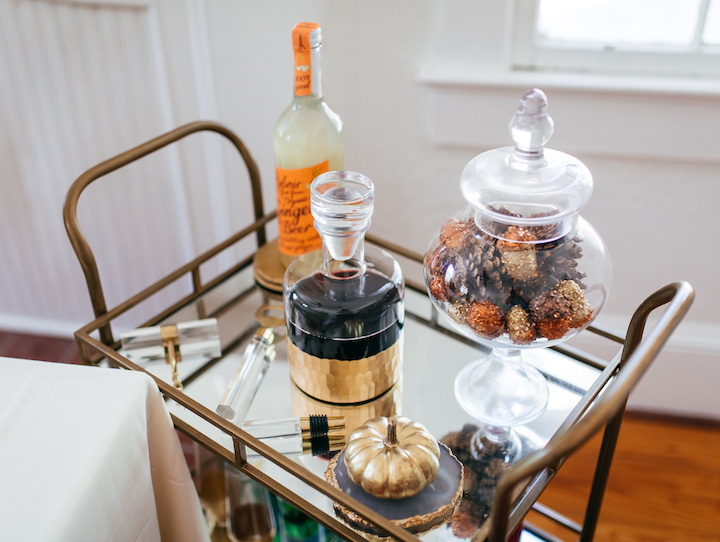 Don’t forget that desserts make great decor too! 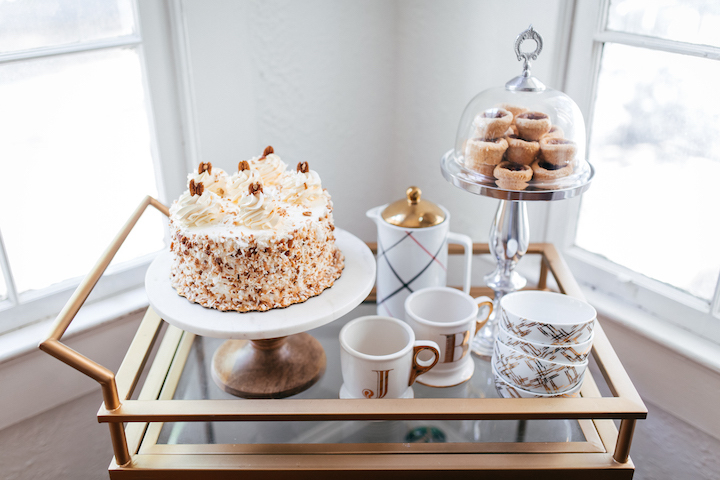 Arrange all of your your desserts and treats on a bar cart or small table for everyone to feast their eyes on. It will also help them to remember to save some extra room!